The Church of the Ascension is next door to South Twerton School, at the top of Claude Avenue. It was built in 1909 specifically to serve the (then) new development of housing in the South Twerton area. 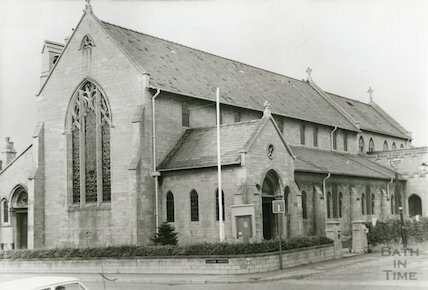 The Parish already had its mother church, St Michael, in old Twerton and had added St Peter's on the Lower Bristol Rd to serve 'East Twerton' as housing filled the gap between Twerton and the boundary with Bath at Brougham Hayes. As housebuilding in the parish had then stretched south towards the Somerset & Dorset railway line, the parish erected a tin church in Maybrick Road. This was superseded by the Church of the Ascension, leaving the tin church as its church hall until a new church hall was built on the church premises in the 1960s, at which point the tin hall in Maybrick Road was demolished and housing built in its place. As such, the Church of the Ascension served exactly the same catchment area as South Twerton School at the time it was built and for some time afterwards. There is therefore a considerable overlap between the names on the South Twerton School memorial and those on the memorial at the Church. 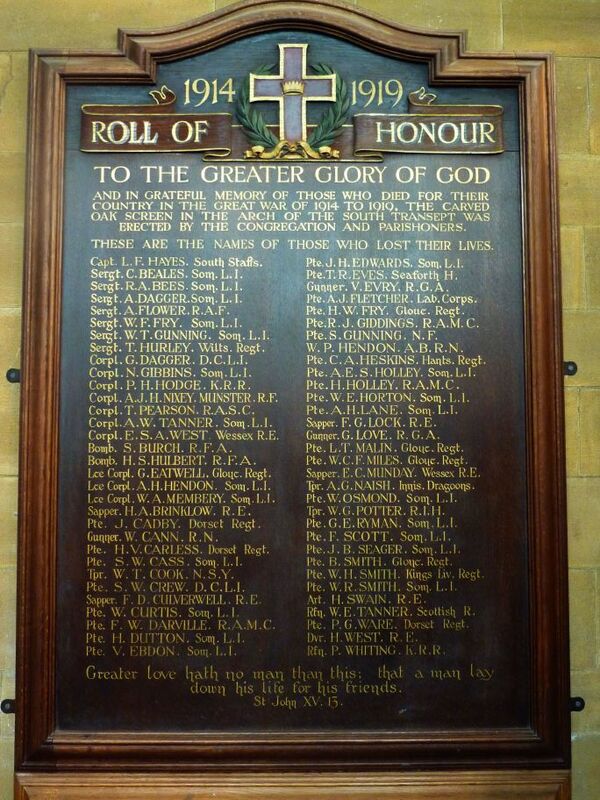 In the presence of a large congregation, the parochial war memorials in the Church of the Ascension, South Twerton, were unveiled on Sunday evening by the vicar (the Rev. Pryce Davies) and dedicated (in the unavoidable absence of the Lord Bishop of the Diocese) by Preb. M. E. Hoets, R.D. A special form of service was used. The memorial consists of a carved oak screen at the entrance to the south transept, which gives access to the organ chamber and the choir vestry, with a tablet, also in oak, which bears an inscription indicating the purpose of the screen and commemorating the fallen. The tablet, which is placed on the adjoining south-east wall, bears a cross encircled with a laurel crown, surmounting the inscription: "To the greater glory of God and in grateful memory of those who died in the great war of 1914 to 1919. The carved oak screen in the arch of the south transept was erected by the congregation and parishioners. These are the names of those who lost their lives". Then follow the names of the fallen, and at the foot of the tablet is the well-known text "Greater love hath no man than this, that a man lay down his life for his friends." The processional hymn was "Pleasant are Thy courts above" and the special psalm was the 84th, "O how amiable are thy dwellings." The lesson, read by the vicar, was taken from Ephesians, vi., verses 10 to 18 inclusive. Before the anthem - Stainer's "What are these?" - was sung, the vicar read the names of the 61 parishioners and members of the congregation who have perished. [see list below]. After the anthem, Preb. Hoets, attended by the wardens, Mssrs. J. Aplin & F. C. Bryant, dedicated the oak screen and tablet, which were formally unveiled by the vicar. Having read the appointed prayers, Preb. Hoets said: "May those who enter this church and gaze on these memorials remembr the words of St. Anselm: "They who die for justice die for Christ". the hymn by John S. Arkwright "O valiant hearts" preceded the sermon. Preaching from Exodus, chapter xxxviii., verse 29. "A memorial before the Lord continually", Preb. Hoets said he considered the memorial which had just been dedicated fulfilled its character perfectly. He was one of those people who were strongly opposed to making these memorials serve the interests - in some cases, even the selfish recreation - of the living. Directly a memorial became what was called utilitarian it lost its distinctive character. A memorial should be a perpetual reminder to the living of those whose services it sought to commemorate, and a perpetual memorial to them also of the sacrifice of the dead. No one who entered that church and gazed on that memorial could fail to realise what it was. It was a memorial of those men who had died gallantly and willingly for King and Country. And the associations of the church were emphasised in this fact. These men were not dead. They were one withus in the communion of the Eucharist, which summoned them to the side of the living. They lived and were one with the living in that praise and thanksgiving. Those who led the people of that parish - the vicar and churchwardens - had certanily done their best in choosing that form of memorial. There were cases in which the form adopted for such a memorial exhibited gross selfishness. He was glad that parish had made such a suitable choice, and that the mother parish of Twerton, with which he had been connected for 15 years as Rural Dean of Keynsham, had exhibited a similar attitude on the question. Such wise decisions made him feel that he could thank God and take courage. Personally, said Preb. Hoets, he deprecated the customary harangues addressed to men who died as these had done. In former days, soldiers spoke little to soldiers, and civilians not at all. He did not think that in these respects the change of opinion to-day was for the better. As a model address to soldiers, Preb. Hoets cited the speech by Napoleon, who reviewed the remnant of the regiment of his Guards after a victory in which they had lost heavily. The General's speech was simply "Men of the Guards - my Guards - I am content with you". In some such simple terms as that we might well express our appreciation of the loyalty and devotion of those who had upheld our cause - those brothers who were not dead, and who were still with us in that service of the Eucharist, in which the whole church was united. The offertory hymn was "The Saints of God" and the concluding hymn was "Lead, Kindly Light". The screen and tablet are the work of Mr. F. J. Blackmore of Twerton.